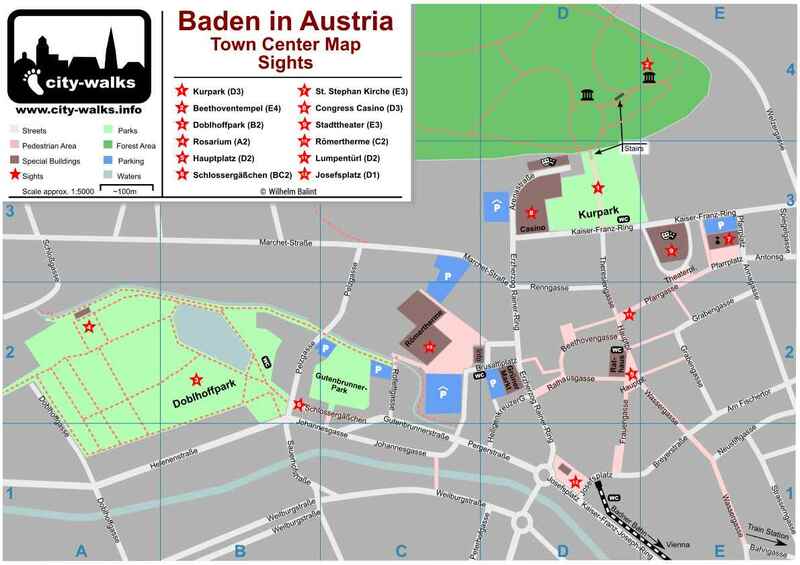 In the center of Baden in Austria it is only allowed to park your car for a limited period of time and you have to pay a fee at following times: Monday to Friday: 8:00 to 12:00 and 13:30 bis 18:00 o'clock, Saturday 9:00 to 12:00 o'clock Maximum parking time in the town center is 90 minutes. The parking fee is 0,50 Euro for 30 minutes. You can buy a ticket directly at numerous parking ticket machines on the street. But you can also choose one of the parking garages. One of the best place to park you car in the town centre is the garage at the Spa Römertherme. It is reachable by the Brusattiplatz or the Pergerstraße. You can find this car park in the town center map Baden in Austria at the square C2 and it offers 353 lots in a good location. The parking fee is 0,50 Euro for 30 minutes.